Home Other Canada's Largest Elevated Go Kart Track Set to Open in 2019. 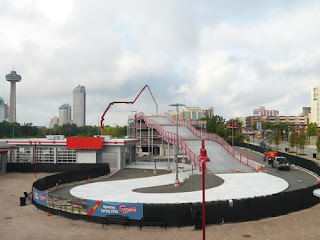 Canada's Largest Elevated Go Kart Track Set to Open in 2019. Mario Kart-like Karting Track is Largest in North America. 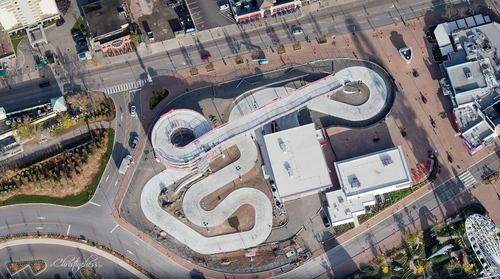 Niagara Falls Ontario is getting quite the go-kart track that may warrant a visiting. The Parking-lot style up ramp is followed by quite the funfair slide-type drop. Niagara Speedway is a marriage of traditional go-karts with the added fun & excitement of an elevated coaster styled track. Drivers get to test their driving skills along the straightaway, negotiate the hair-pin turns, and climb the elevated ramp as they head for the checkered flag. "It looks like we're going to finish construction this fall, and hopefully in October we're going to do all our testing," said Harry Oakes, President of HOCO Limited, who owns and operates attractions, restaurants and shops on the south side of Clifton Hill. "We'll shut down for the winter, and then we're looking to launch in the spring, as soon as the weather breaks." The track is going in next to the Niagra Sky Wheel and is expected to open in Spring 2019.